Quite a few movie stars and film personalities descended to Hyderabad's Shilpa Kala Vedika auditorium in Madapur on April 20 to attend the TSR TV9 film awards. The awards has been named after industrialist-politician T Subbarami Reddy. Actress Neha Dhupia was one of the performers of the evening. Click Next to see pictures from the awards show. Sridevi and Rani Mukerji caught up at the awards show. Both women received awards -- Sridevi bagged the Empress of Indian cinema award while Rani got the Ever Shining Star award. Sridevi's producer husband Boney Kapoor, who was also present, won the Star Producer of the Millennium award. Actress Shobana, who got the Special Jury award, was among the performers for the evening. Some of cinema's prettiest ladies came together on stage -- Ameesha Patel, Neha Dhupia, Sridevi, Rani Mukerji and Tamannah. 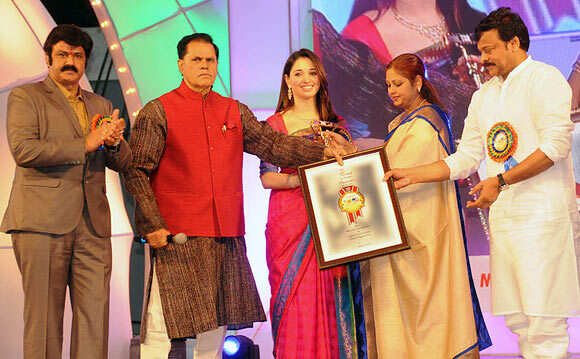 Actress Tamannah, who was recently seen in Himmatwala, receives her Best Actress award for her film 100% Love from Bala Krishna, T Subhrami Reddy, Jayasudha and Chiranjeevi. 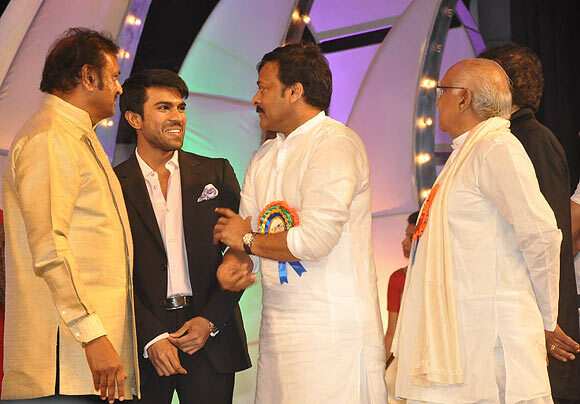 Ram Charan Teja, who received the Best Hero award for his film Rachcha, chats with Telugu cinema's stalwarts Mohan Babu, Chiranjeevi and Akkineni Nageshwara Rao. Zeenat Aman receives the Lifetime Achievement award. 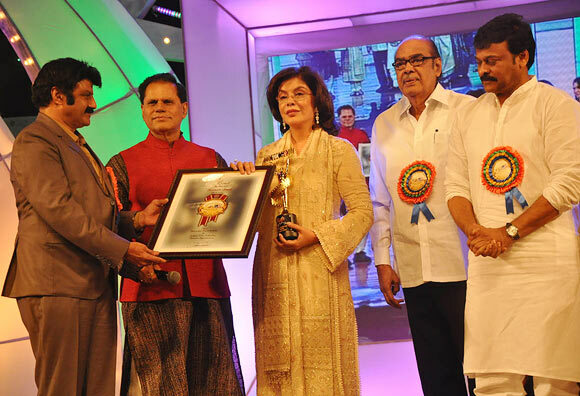 Image: Bala Krishna, T Subhrami Reddy, Zeenat Aman, Venkatesh's father D Ramanaidu and Chiranjeevi. 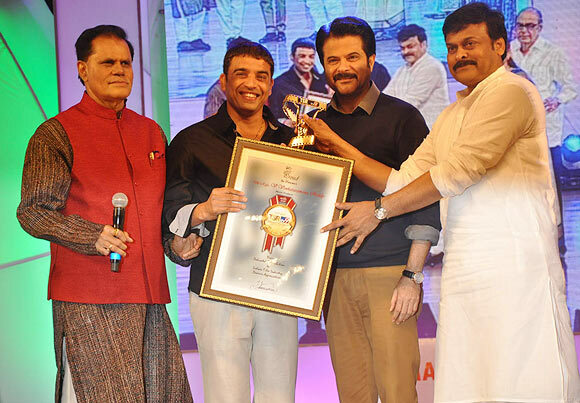 Dil Raju receives the Best Producer award from T Subhrami Reddy, Anil Kapoor and Chiranjeevi. Sana receives the Best Character Actress award for her film, Veedinthe. Actor Rajendra Prasad receives the Universal Performance Actor while Ameesha Patel receives the Best Actress award. Sridevi receives her Empress of Indian Cinema award. 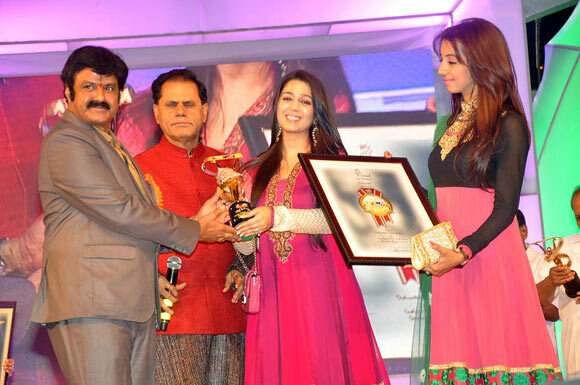 Shatrughan Sinha receives the Millennium Sensation Star award. 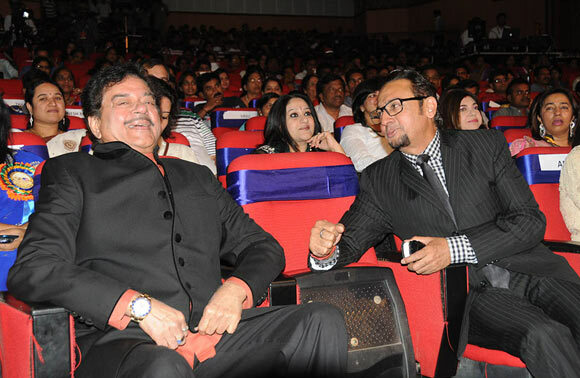 Off stage, Shatrughan Sinha shared a few laughs with Gulshan Grover. The latter received an award for the Best Performance. 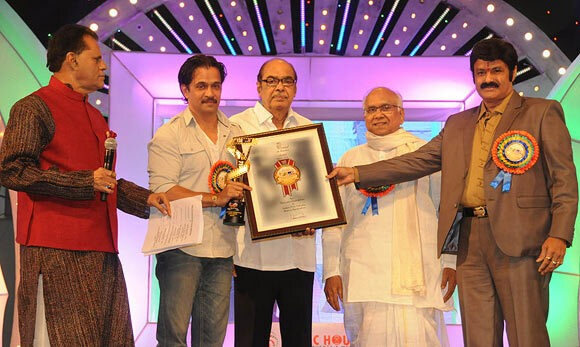 Nagarjuna receives the Best Actor award for his role in Shirdi Sai. Tamil actor Arjun receives the Silver Screen Sensational Actor award. 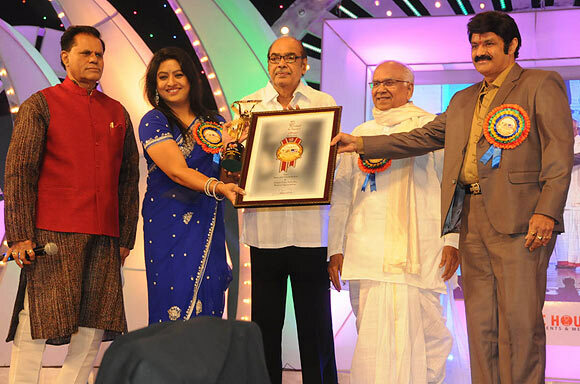 Anushka Shetty receives the Best Heroine award for her film Damarukam. Charmee receives the Special Jury award for her film Mangala. 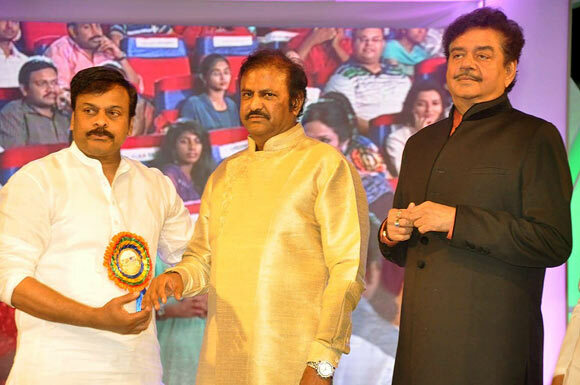 Telugu actor-producer Mohan Babu receives the Best Actor of Millennium. 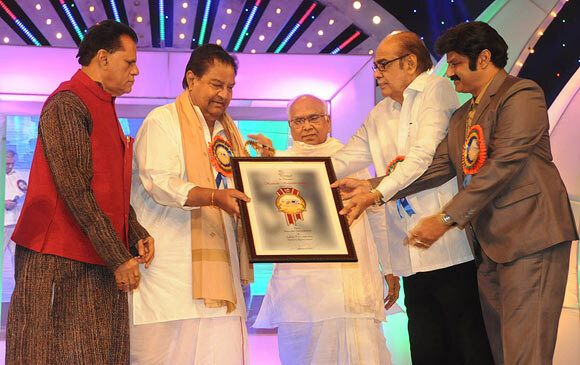 Actor-producer-director Kaikala Satyanarayana receives the Lifetime Achievement award. Lakshmi Manchu receives the Best Actress for Negative role for her work in Anaganaga Oka Dheerudu. 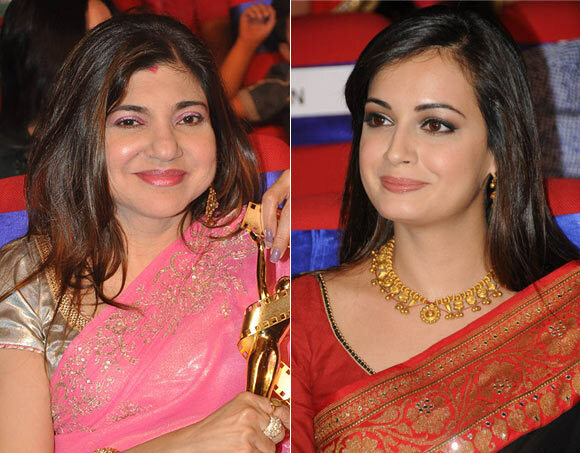 Dia Mirza won the Special Jury award while singer Alka Yagnik won the Best Playback Singer award.